Playing musical scores is a heavy kind of art. The Nootka app will help you understand the basics of music notation reading, and help you improve by practicing various kinds of exercises. 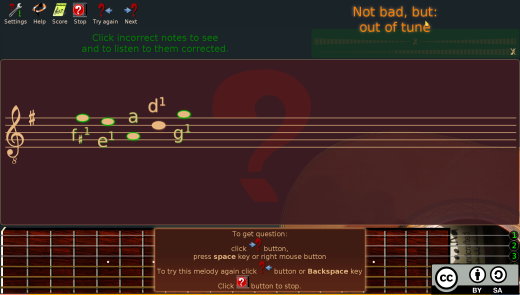 Nootka gives real-time feedback, has multiple difficulty levels, and is customizable. 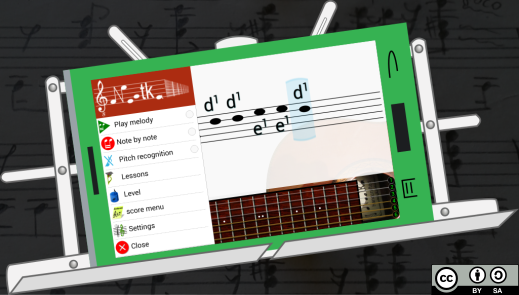 You play or sing notes displayed by the app. Nootka tells you in real time if you're playing them correctly. The app has an interactive interface to discover how the scores work, and an accurate pitch detection algorithm that can capture sounds from any microphone or web cam, and display them in the score. But, the heart of Nootka is the exercises and exams. 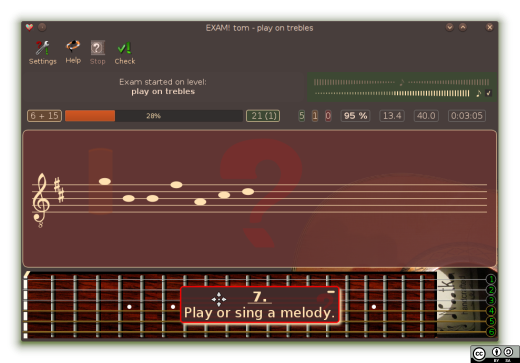 The app asks a question which can be: a single note or whole melody on the score, a position on the guitar, a played melody, or just a note name. Then you give your answer. You can play on a real instrument, write the score of a melody you're listening to, or simply enter a note name. Nootka has many built-in levels of difficulty, and you may create your own, or a teacher can prepare levels for students. When you are exercising with Nootka it can be like a friendly teacher. It will show clues or corrected answers when you make a mistake. But when passing exams, Nootka is like a strict and "old school" master. Mistakes are punished with penalty questions and there are no clues. But after all that, Nootka gives a certificate for exam completion. 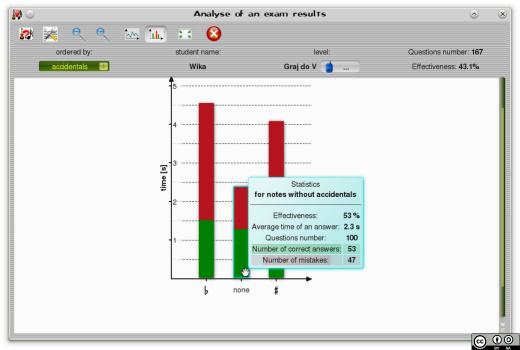 Exams can be stored in files and analyzed, so users and teachers will see the weak points. Nootka was designed specifically for guitarists (classical, electric or bass) but it is usable by all musicians. There are many options to customize the app for user needs, e.g. select among different guitar tunings, select another instrument, adjust the frequency of notes, transpose, select a clef or a grand staff notation, note naming style, and many, many more. I suppose it's a useful app to those who want to learn to play instruments. But we would add an option to choose either "a strict teacher" with punishment or with hints to what exactly must be improved. Sometimes it's hard to see the mistake, that's why it would help a lot as well. But this app is worth trying. Thanks. Indeed, in any case (soft exercise or strict exam), informations about mistakes might be more straightforward. I will try to do it. Also, there is an idea to add a possibility of assembling some exercise/exam from questions with mistakes only.